Submitted by jefferbob on Tue, 11/11/2008 - 4:37pm. In 1955, in a small storefront on Indianapolis' north side, H. H. and Fansy Gregg first walked the sales floor of their new appliance store. The Gregg's new store featured washing machines, clothes dryers, refrigerators and outdoor grills. Not long after, the family began selling black & white and the newest color television sets, along with other electronic products. The business was founded on personal, caring customer service. Customers enjoyed the personal service and attention to detail the store offered, and business prospered. Over the years, hhgregg added new locations throughout Alabama, Indiana, Kentucky, Ohio, North Carolina, South Carolina, Tennessee and Georgia. 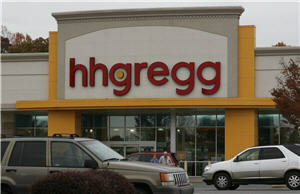 Today, hhgregg is one of the nation's leading retailers of home appliances and consumer electronics. Still operated by the Gregg family, the services we offer continue to show that we care about our customers' complete satisfaction.